Pearls are all the same, they just come in different shapes and colors right? Wrong. However this is a misconception that most people have. For starters, there are two main classes of pearls: freshwater and saltwater pearls. While freshwater pearls can be beautiful, at Seven Seas Pearls we work with only saltwater pearls. Saltwater pearls are exactly what they sound like – pearls that come from the ocean. Freshwater pearls on the other hand can be cultivated in streams, lakes and rivers. Saltwater pearls are broken into three main categories: Akoya Pearls, Tahitian Pearls and South Sea Pearls. -Believe it or not if you know this, then your pearl knowledge is already leaps and bounds above the general public. What separates these classifications of pearls is the region where they are farmed. Akoya Pearls come from the farming waters in Japan, Tahitian Pearls come from the French Polynesian Islands and South Sea Pearls come from the waters of Australia. 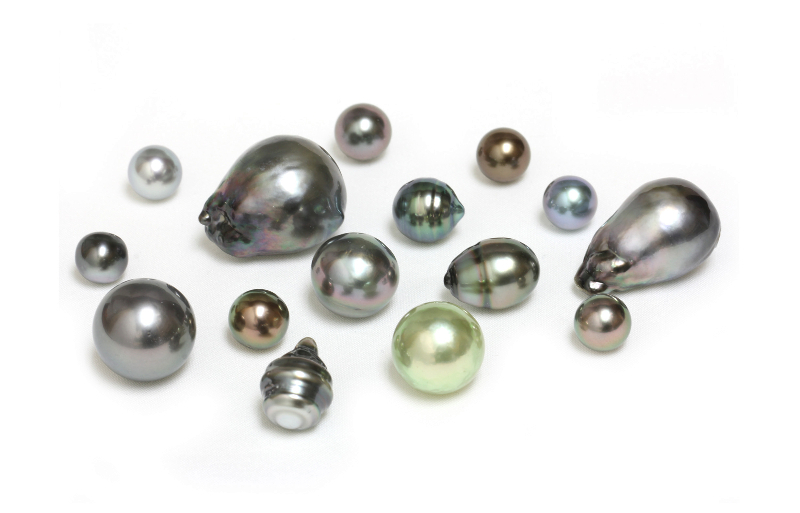 Each sub-type of pearl has general outlines regarding color and size. Once you become familiar with these outlines, you will be able to identify where any type of saltwater pearl is from! 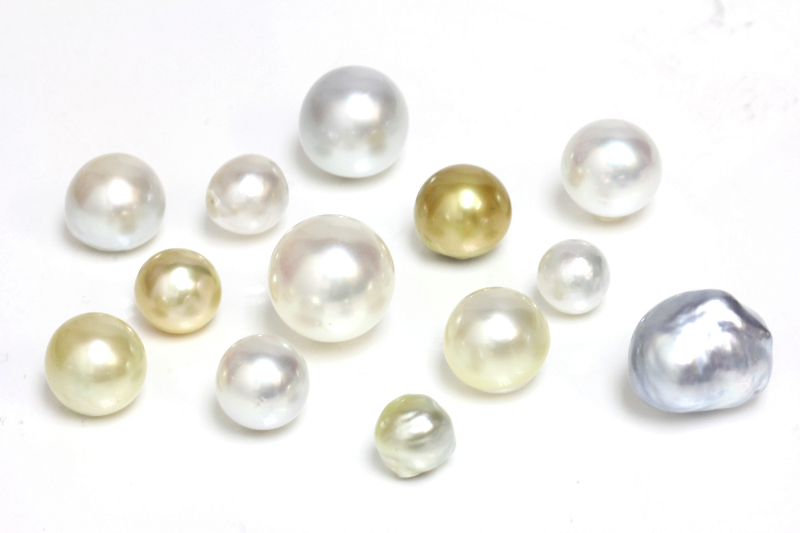 Akoya Pearls: These gems are the smallest in size in comparison to Tahitian and South Sea Pearls. Akoya Pearls range in size from 2mm all the way to 10mm with 7mm being the most common. Akoya Pearls are typically considered to be the “Classic” pearl. Akoya Pearls come in more muted tones than their Tahitian or South Sea counterparts. 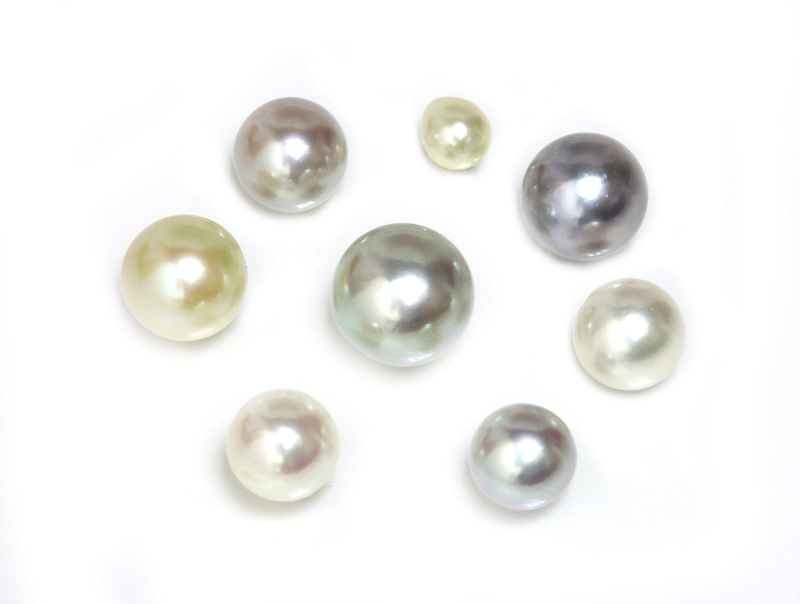 Akoya Pearls can range in color from white, to ivory, rose, silver, gray to blue. Each of these stunning “base” colors will have gorgeous overtones that will really make them stand out. – For example, gray Akoya Pearls with a purple overtone. Tahitian Pearls: These metallic beauties are known for their incredible rainbow of colors. They are larger than Akoya Pearls and typically range from 9mm all the way to 18mm. What makes these pearls unique is their incredible gray and black color. These base colors are simply incredible when paired with stunning overtones such as purple, peacock, green, blue etc. South Sea Pearls are the largest of all saltwater pearls. These gorgeous gems range in size from 8mm all the way to 27mm. Like Akoya’s, South Sea Pearls are known for their more muted and pastel colors. South Sea Pearls are famously known for their deep golden and champagne colors but also come in a full spectrum of ivory, white, blue pistachio and light pistachio. As you can see, there is a vast difference between each of these types of pearls. Once you become familiar with the colors and sizes, it becomes quite easy to determine where a pearl has originated from. Check back soon for a more in-depth look at each of these subtypes of pearls.